← A “LEGAL REMEDY” for your Valentine’s Day? Although I don’t know the context, or the underlying issues in the case that led to this opinion from Justice Kagan, I’m not sure it really matters. Apparently there was some dispute about whether a statute authorized criminal sanctions for fishermen who allegedly dispose of undersized fish. 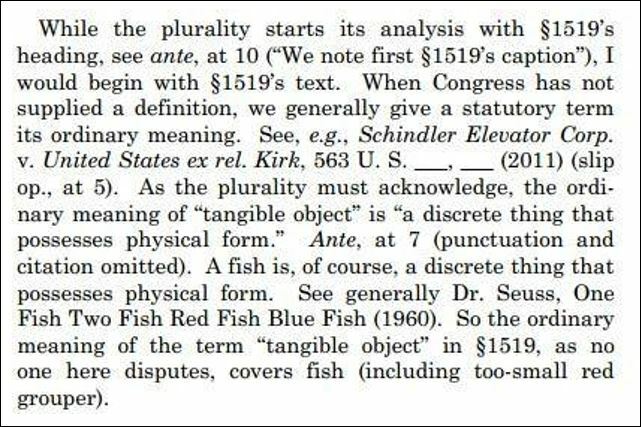 The arguments involved the legal meaning of the term “tangible object” and whether fish — red groupers, to be specific– qualified. To lend veracity and authenticity to her reasoned and erudite opinion, Justice Kagan cites an authority beyond dispute, and in so doing, surely she wins the award for the all-time greatest single citation to ever appear in a United States Supreme Court opinion. This entry was posted in Legal Trends, The View from "The Trenches" and tagged civil litigation, DaisleyLaw, Justice Kagan, SCOTUS. Bookmark the permalink.